Since having June my car has felt like an atomic bomb went off inside. I can never keep it organized or clean. I feel like I am always throwing needed toys or diapers in the car, cleaning up soda spills, and trying to figure out where the weird smell is coming from. 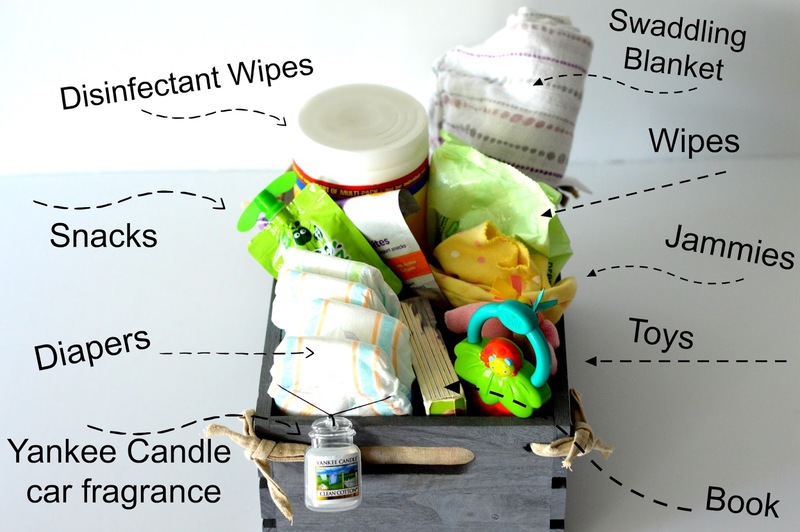 I finally got sick of the car insanity and created a car baby basket to keep my car clean, organized and smelling fresh. I've been using it for a week and I actually want to drive my car again. Everything has a place! June has all the supplies she needs. The car is clean! In my infinite goodness and wisdom, I am sharing my baby car basket with you. Pin now, thank later as they say! 1- Swaddle blanket- June is way past the swaddle stage, but I've found having a swaddling blanket on hand at all times is a life saver. Usually she uses it to cuddle with in the backseat but it doubles as a nursing cover, napkin, washcloth, picnic blanket, whatever you need it to be. 2- Jammies- I can not count the number of times we have been out somewhere, it has gotten late, and I have kicked myself for not having jammies for June. Having her jams with us in the car means we can always get her changed and ready for bed (If it's after 7:00 she will fall asleep in the car EVERY. TIME.) and the transition into her crib is so much easier when we get home. 3- Diapers- do I really need to explain this one? It's pretty much imperative to always have diapers in the car. 4- Wipes- the obvious reason is for diaper changes, but wipes are another thing that I find has a use for everything. Wiping up spills, cleaning off dirty hands, wiping the dog's paws after he's been playing in the mud, etc, etc, etc. If you have kids, do not go anywhere in your car without wipes if you know what's good for you. 5- Snacks- We're kind of at a difficult car seat stage; June is old enough to know what's going on and wants to interact with the other people in the car, but she is still sentenced to a rear facing car life for another year. (I hate that car seats have to be rear facing for two years now- does anybody else's child struggle always staring at the back of a seat all day?) When she gets fussy back there snacks are the fastest and easiest way to keep her happy. Her favorites are applesauce (I love the pouches- makes it so easy on me.) and dried yogurt chips. June goes bonkers over those things. 6- Toys- as per car seat issue noted above, anything to keep June entertained is key. Also as June is teething, anything for her to chew on is a big help. 7- Disinfectant wipes- I started carrying these around in my car in college and have continued doing it since because it's a total game changer in having your car clean (or at least presentable) at all times. Having cleaning wipes in the car at all times helps with smoothie spills, diet coke spills, junk all over the car seat, dust on the dashboard, etc, etc, etc. 8- Book- Having a book in the car for June to flip and read and play with always helps her keep busy. It's also nice because if we are at some kind of formal event longer than we think we're going to be, (church, wedding, meeting, etc.) June will sit on my lap quietly with a book much longer than she would otherwise. 9- Car freshener- one of the biggest things in keeping the car fresh is a car freshener. No duh! I am huge into smell and if the car doesn't smell good then it doesn't feel clean to me. I always have a car freshener in the car and my most recent favorites are the Yankee Smart Scent Vent Clips or Yankee Car Jar Ultimate. The Jar is perfect to place in any small space- I put mine right in my car basket with all my car hack supplies. The vent clips give the car that extra boost of fragrance and neutralizes odors. (Also you can adjust the strength of the fragrance using the slider on the back of the clip.) I always love a classic clean laundry smell so the clean cotton fragrance is my jam. It makes my whole car smell like someone just did the laundry! No one did any laundry, but we like to fool people in my car. 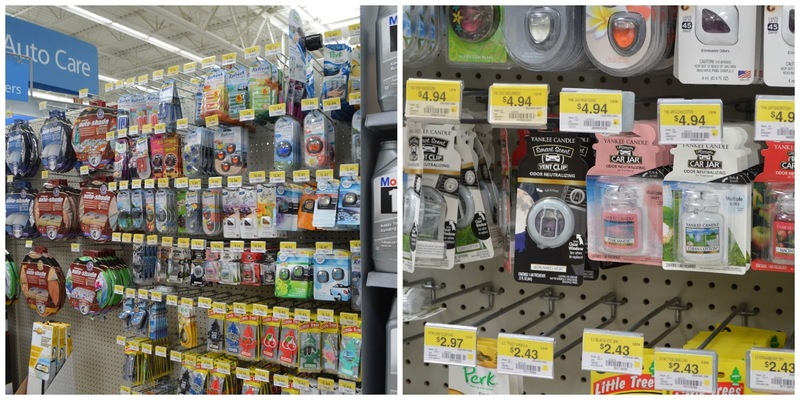 You can find Yankee Car Jar and Yankee Smart Scent Vent Clips in the Auto Fragrance and Air Care sections of Walmart. I easily found mine by the car fresheners, and I was pleased with the variety of scents that they had available. Also both products were under $5. Score!